South Queensferry, Carmelite Friary Church. 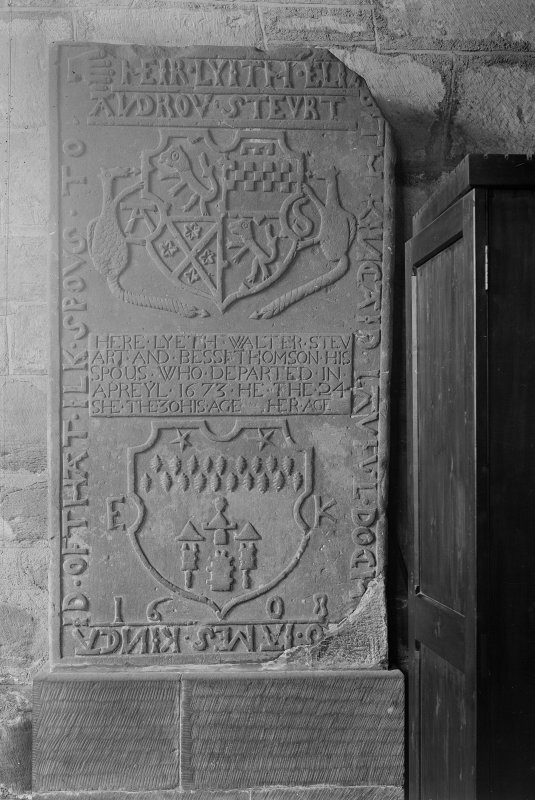 Detail of tombstone on West wall in South chapel. South Queensferry, Carmelite Friary Church. 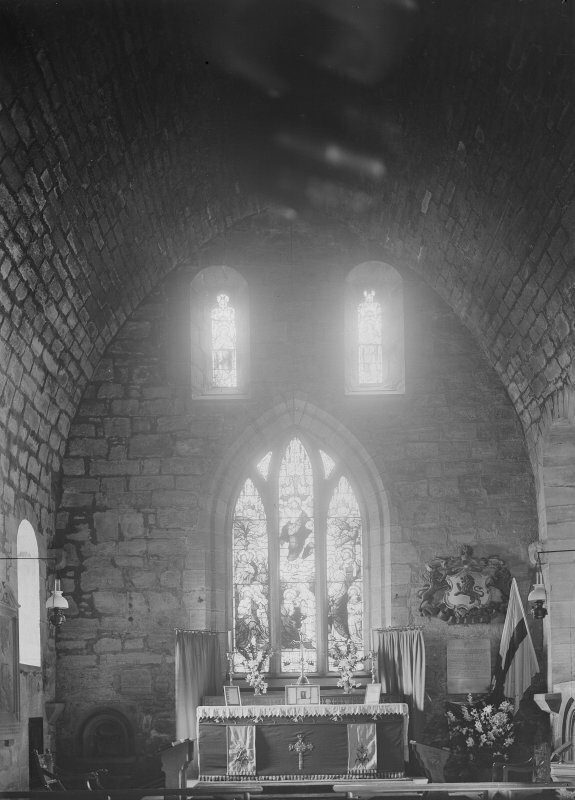 View of interior of chancel from West. South Queensferry, Carmelite Friary Church. 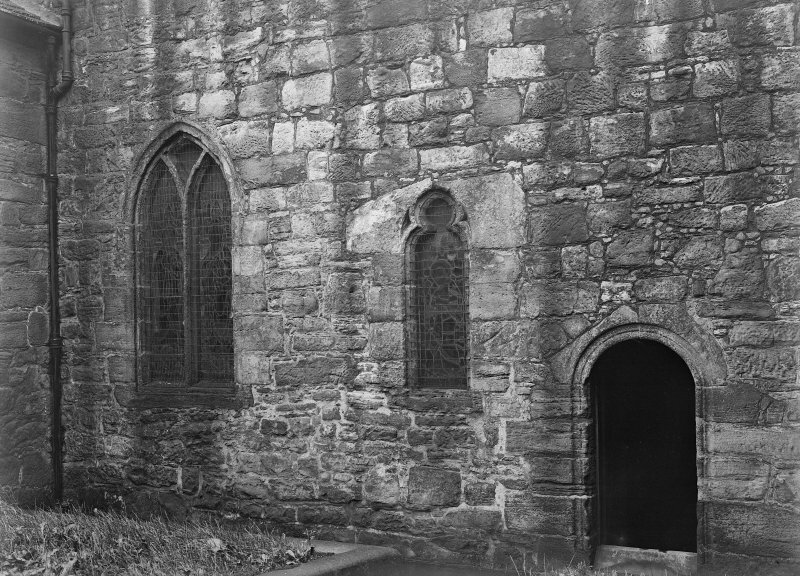 View of choir doorway and windows on the South front. South Queensferry, Carmelite Friary Church. South Queensferry, Carmelite Friary Church. View of piscina and sedilia. South Queensferry, Carmelite Friary Church. View South transept. South Queensferry, Carmelite Friary Church. View of South transept. 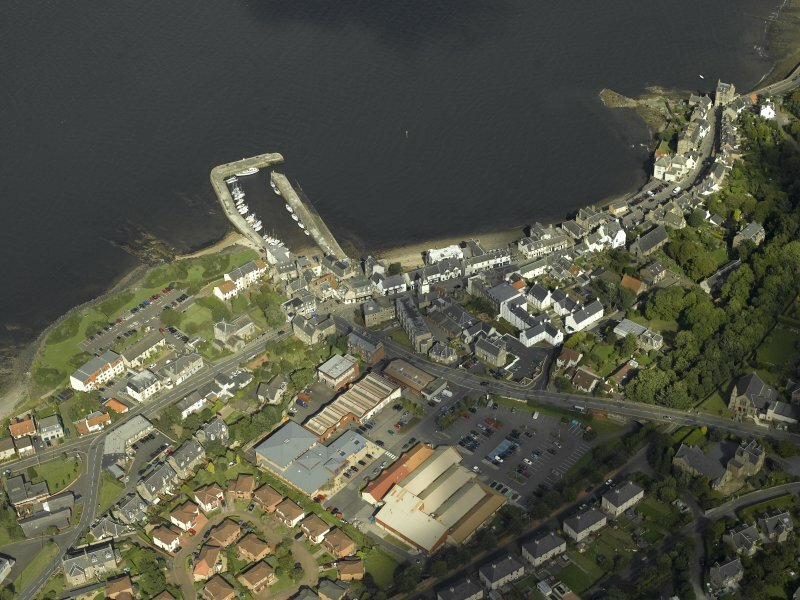 General oblique aerial view centred on the harbour, taken from the SW. Formerly also entered as NT17NW 75: Former Carmelite Friary Church at NT 1287 7843. 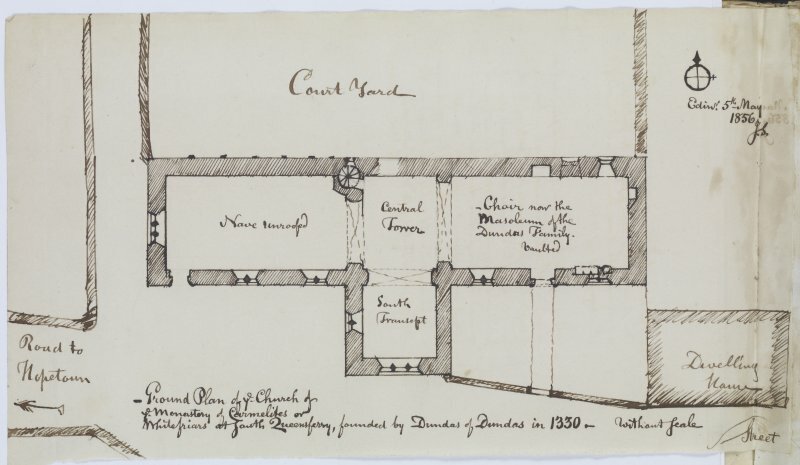 Allegedly founded in 1330, this Carmelite Friary, dedicated to the Virgin Mary, was founded by James Dundas of Dundas in 1440-1 and ceased to exist by 1564-5. 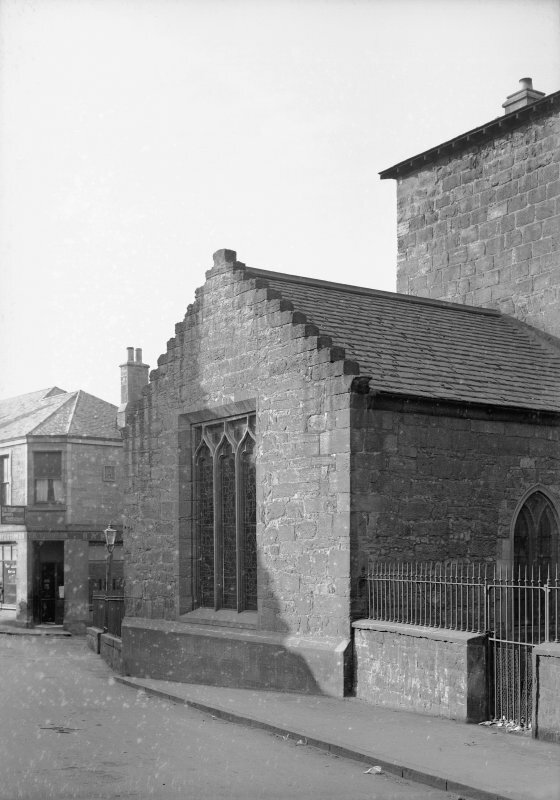 All that remains is part of the 15th century church; its original plan consisted on a lengthy chancel and a relatively short nave (which was removed about 1875). 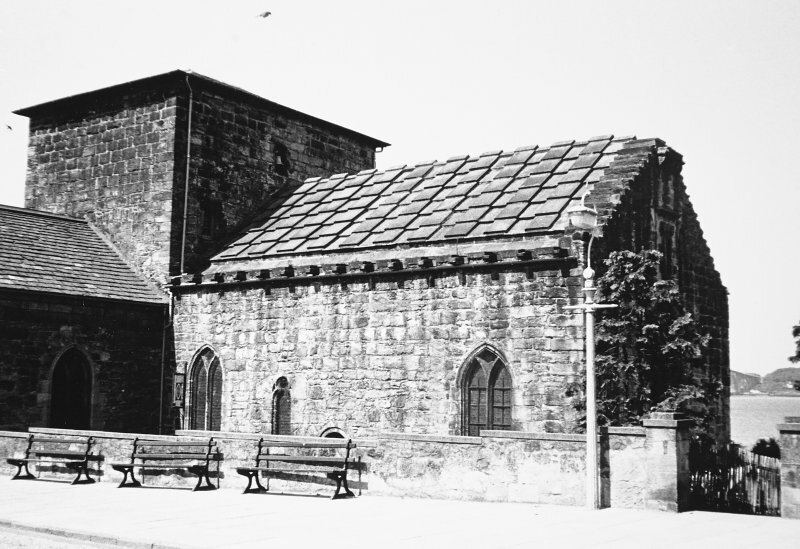 The nave and chancel were formerly separated by a low stone cross-wall and a vaulted passage, which forms the lowest floor of what was a three-storeyed tower, which originally had a cap-house and parapet walk but is now reduced to two storeys, with a piended slate roof. The passage extended S to form a transeptal chapel (now baptistry). The walls are of good rubble work, though the upper part of the tower is of ashlar. 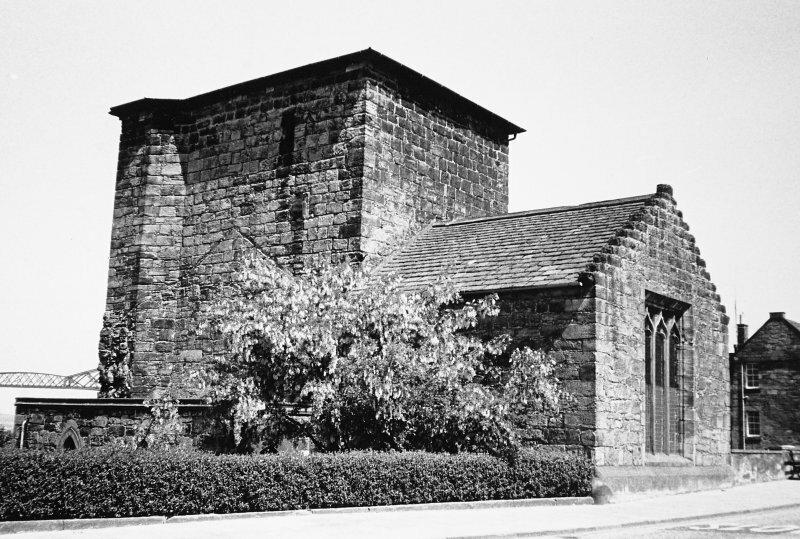 The building was fairly complete until the mid-19th century, but became so ruinous that in 1890 it was restored and re-consecrated as an Episcopal church. 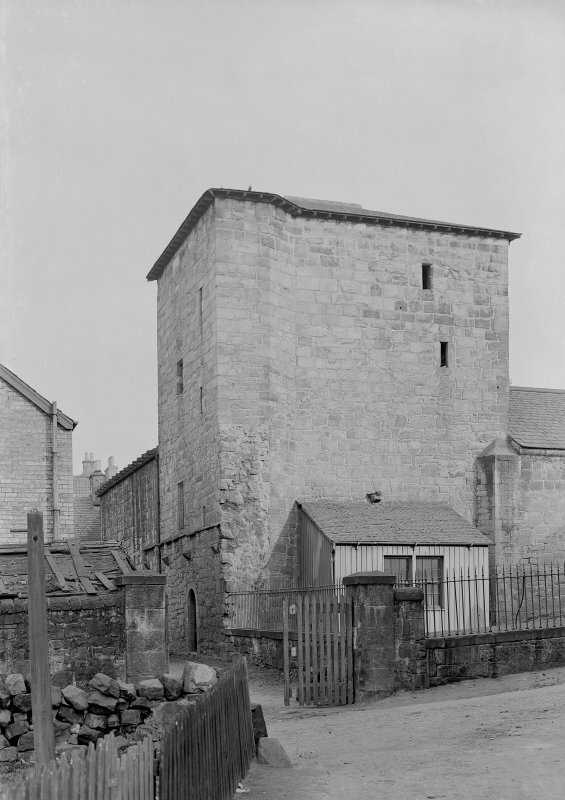 In 1926, the church was in good repair, but the tower chambers, in use as a dovecot, were in bad order. A roofed cloister walk appears to have adjoined this church, but recent excavations failed to reveal any foundations of a claustral lay-out. The monastic buildings were believed to have stood N of the church on what is now waste land. Six trenches were dug in 1970-1 in this waste land in the area of the E range, but were found to be filled with comparatively modern midden material down to the old beach surface. In only one trench, about 30ft N of the church, were remains of the foundation of a light wall, possibly connected with monastic times. A further trench to trace the N range of buildings had to be abandoned before it was fully explored. Sherds of medieval and later pottery, found among the midden material, were donated to the National Museum of Antiquities of Scotland (NMAS). This building is still in use as a place of worship and has been considerably restored. There is no trace of any remains of conventual buildings. Visited by OS (BS) 14 August 1974. 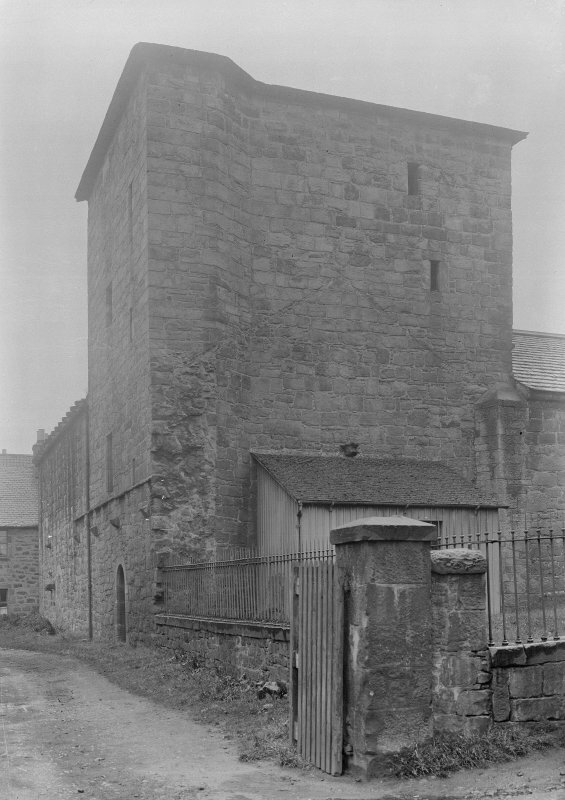 Thought to have been founded in 1330, this friary was certainly in existence by 1441, and was closed by 1565. 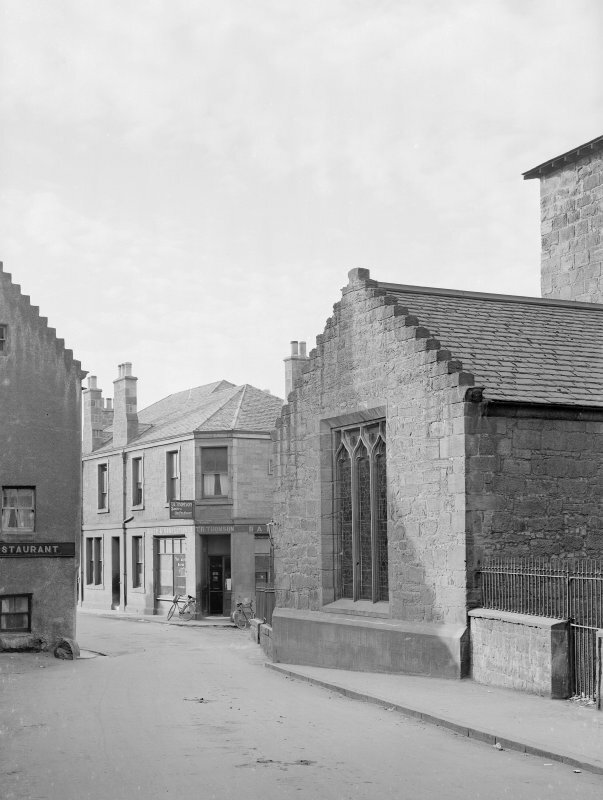 The buildings were still in good condition in the mid 19th century but it had become ruinous by 1890, when it was restored and reconsecrated as the Episcopal Church for South Queensferry. Excavations to the N of the church in 1970-71 failed to locate the claustral range, but medieval midden material was found. There are no changes to NMRS description (1974), apart from noting that a certain amount of weathering of the stonework is taking place. 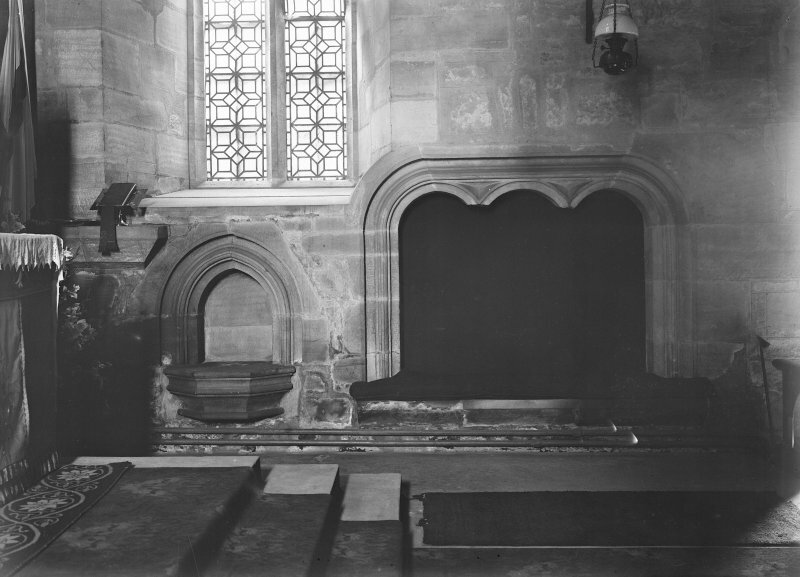 NT 1287 7843 An archaeological watching brief was undertaken during the installation of underfloor heating, in the E end of the church (NMRS NT17NW 11), and also during the laying of a gas pipe along the outer S and E sides of the church. The excavations within the church were limited to an average depth of 0.2m and revealed a mixed burial soil containing disarticulated human remains and finds dating from between the 15th and 17th centuries. The date range of the finds correlates directly to the active period of the present priory church between 1441 and 1635. Further medieval inhumations were uncovered lying immediately outwith the church, to the S and E. These where recorded in the ground and remain in situ. Sponsor:	Priory Church of St Mary, South Queensferry. D Henderson and J A Lawson 2000. Society of Antiquaries of Scotland Topographical Collection - 1 Lithograph held by NMRS. An archaeological pre-determination test pitting evaluation was carried out in advance of the construction of a wall (between NT12897 78420 anf NT 12900 78434). Three test pits were excavated along the north-south alignment of the proposed wall. The results of the test-pitting indicated that much of the area where the proposed wall is to be built has been built up by just under a metre of demolition rubble, presumably from the houses depicted on the first and second Edition OS maps which were demolished sometime after 1955; there are also buildings in this approximate location shown on Roy's Military Survey of 1750, so these former buildings could have been 18th century in origin. The only surviving feature was a concrete slab or floor surface with one mortar-bonded block of sandstone overlying it.